“Commentating as Philosophy and the Abrahamic Interpreters” started today at Sismanoglio Megaro (Istiklal Cd), continues at Heybeliada on Thursday, and then back to SM for Friday and Saturday. All welcome! David Butorac at ODTÜ / METU: Demiurgic Blues: can there be a Neoplatonic Science of Nature? The paper will look at the Neoplatonic reception of the “Timaeus”, along with other Platonic conceptions about the nature of the sensible, and how this relates to the Platonic demand for stable objects of thought. However, I will argue, because everything other than the first principle – both the content of thought and the constitution of the sensible – is composed of the Dyad of limit and unlimited, it renders the human soul incapable of having stable object, apart from the One. A science of nature is, in principle, impossible. Further, I will show that Proclus was trying to overcome precisely the problem of the One’s separation from multiplicity and to ground a science in that principle, but could not achieve this end. Monday, December 16, ODTÜ / METU, room B103 in the Beşeri Binası at 14.40. I’ll be giving a talk at Istanbul University in the department of philosophy tomorrow (Wednesday), Oct 30 (Seminar room 206, starting at 15:30). The talk is entitled, “‘The heavens declare the glory of the Lord’? Reflections on the instability of Nature in the Ancient and Mediaeval World”. The paper will discuss both the positive and negative sides of the pre-early modern concept of nature, where, on one hand, everything is full of gods (Thales) and nature is considered as divine (Greek) or created ‘good’ (Abrahamic). One would think that, as such, it provides the mind with a stable object of thought. However, on the other hand, I will argue it is precisely its possession of some imbued content, even if it is divine, that renders nature unstable. Flight from nature is the result. I will argue that Descartes by reducing the natural world to res extensa resolves precisely this instability and which thereby allows the secrets of nature of be revealed. Together with the lecture, the CorISTAnbul Chamber Choir and Orchestra, featuring Kevork Tavityan, baritone. For further information about the choir, see http://coristanbul.com/. The conference as a whole is sponsored by the Consulate General of Greece in Istanbul, the Kingdom of the Netherlands, as a part of the celebration of “400 years of diplomatic relations between the Netherlands and Turkey”, and the Consulate General of Israel in Istanbul. The university sponsors are Fatih University, Bogazici University and Yildiz Technical University. The conference takes place under the auspices of the ISNS. For further information, see http://arxai.org/conferences/abrahamictrilogy/program and for questions, email David Butorac at davidbutorac@arxai.org. 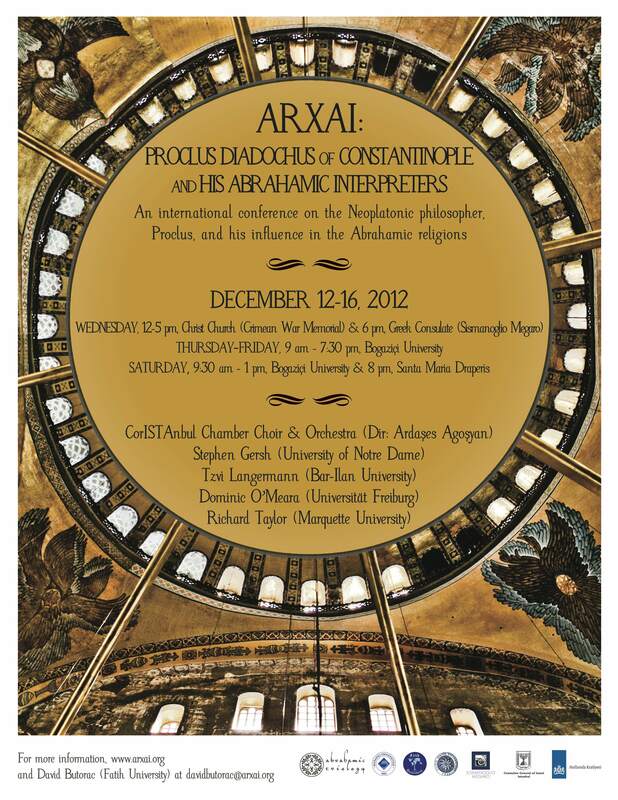 As a part of the conference, Arxai: Proclus Diadochus of Constantinople and his Abrahamic Interpreters, Prof. Richard Taylor (Marquette University & KU Leuven) will present a lecture entitled, “Proclus Arabus and Divine Primary Causality in the Arabic/Islamic Tradition”. The conference will take place on Friday December 14, 2012, at Bogazici University (South Campus), at 5:30 pm, İbrahim Bodur Oditoryumu. Abstract: In this presentation I first provide information on the works of Proclus influential on the Arabic / Islamic philosophical tradition. As an illustration of that importance, I then turn to the philosophical issue of primary causality and show the importance of Proclus in the metaphysical thought of al-Kindi and Ibn Sina / Avicenna on the nature of God’s causal influence over all created being. He is the chief organizer for the “Aquinas and ‘the Arabs’ International Working Group,” a group of philosophers deeply interested in Arabic / Islamic philosophy in its own right and in its influence on European thought. They are very interested in collaborations with scholars of similar interests throughout the world. They have annual conferences in Europe (early Summer now usually 2 conferences) and in North America (Fall) but hope soon to expand our connections to North Africa and the wider Middle East. See www.AquinasAndTheArabs.org. He also organises annual summer conferences on “Philosophy in the Abrahamic Traditions” at the University of Denver and Marquette University in alternate years. As a part of the conference, Arxai: Proclus Diadochus of Constantinople and his Abrahamic Interpreters, Prof. Tzvi Langermann will present a lecture on “Proclus and his Cameo Appearances in Jewish Writings”. The lecture will be held at Bogazici University, on Thursday, Dec 13th, at 5:30, in the Büyük Toplantı Salonu / Albert Long Hall (South Campus). Tzvi Langermann earned his PhD in History of Science at Harvard. He teaches now at Bar Ilan University, and he publishes widely on science, philosophy, and religious thought in Judaism and Islam. His dissertation, Ibn al-Haytham’s On the Configuration of the World, was later published by Garland. Some of his publications were published in a volume in the Variorum Collected Studies series, entitled The Jews and the Sciences in the Middle Ages(1999). His most recent books are two collections, Avicenna and his Legacy: A Golden Age of Science and Philosophy, (Brepols, Turnhout, 2010), and Monotheism and Ethics: Historical and Contemporary Intersections between Judaism, Christianity, and Islam, (Brill, 2011; Studies on the Children of Abraham, vol. 2). Only with some generosity can one call Proclus a minor figure in writings connected to the Jewish tradition. In medieval times, only one Proclan text was read, though it was not known that he was the author. Rarely can one argue for a specifically Proclan influence, rather than a more general Neoplatonic one, on a given thinker. The situation changes somewhat much later. In the seventeenth century, much of Proclus was available in Latin, and Greek, and a few Jewish intellectuals made use of them. I will have a look at the man who was most familiar with Proclus, Joseph Solomon Delmedigo, a student of Galileo, who cites Proclus’ commentary to Euclid, his ideas on eternity of the world, and his theory of light. The conference as a whole is sponsored by the Consulate General of Greece in Istanbul, the Kingdom of the Netherlands, as a part of the celebration of “400 years of diplomatic relations between the Netherlands and Turkey”, and the Consulate General of Israel in Istanbul. The university sponsors are Fatih University, Bogazici University and Yildiz Technical University. For further questions, email David Butorac at davidbutorac@arxai.org.